The graph shown involves derivatives – a calculus level topic. Before getting into this heavier mathy stuff, consider the title of this post and the other content presented on this blog. Making math accessible to all students is not a special ed or a low level math thing. It is a learning thing. 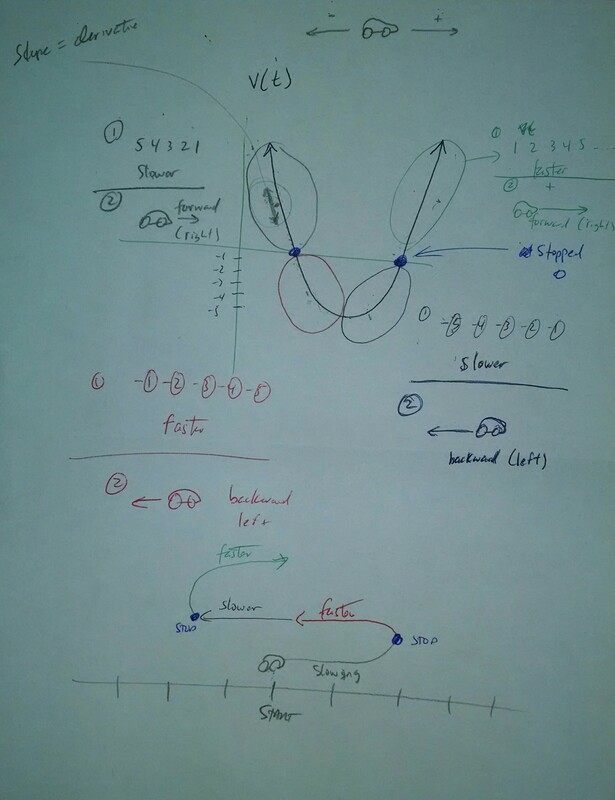 This artifact is what I drew to explain the math concept to a student in calculus to help her grasp the concept as well as the steps. The following are strategies used. As for the mathy stuff, the concept of velocity was address by its two parts: speed (increasing or decreasing) and direction (positive or negative). The graph was broken into the following parts: decreasing positive, decreasing negative, increasing negative and increasing positive. Each part was presented with possible y-values (data) and the sign. The most intuitive part is increasing positive which is a car going forward and speeding up. I find that when I provide intervention, this approach especially by addressing conceptual understanding is effective as the students respond well. Chunky peanut butter means you there are pieces or chunks of peanuts. The peanut butter is broken into distinct parts. Chunking in teaching means breaking a concept or lesson into distinct, smaller parts. This makes it easier for students to process the lesson and the concept. They focus on less content at one time which is important given that working memory has a limited capacity, especially for many students with disabilities. But there is also the conceptual understanding that is often lost on the students. These steps do little to help with conceptual understanding. In the photo below the teacher is presenting a conceptual piece as a chunk of her lesson before she gets to the steps listed above. She has drawn a triangle to represent going downhill, another going uphill and a horizontal line segment representing no hill. The rise and run are listed for each (the horizontal line segment has no rise). The students wrote a rise over run ratio showing the slope for each then practiced this before the teacher moved onto to the steps listed above. Upon completion of this chunk the teacher can give a practice or pop quiz to help students fill in the gaps individual students may have before moving on to the next chunk. The next chunk would not yet involve the formula. 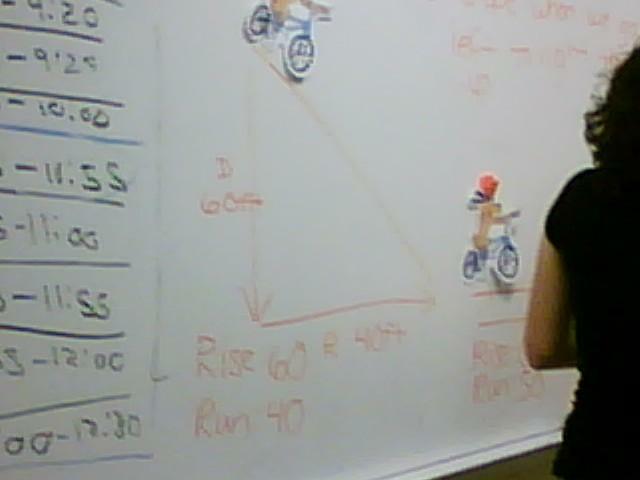 A slope triangle would be drawn under the line to visually represent the rise and run. Students would practice finding slope using this approach with the next step bringing in ordered pairs and the formula listed above.